Photo of a luxurious yacht in Broughton Archipelago Provincial Marine Park off Vancouver Island in British Columbia. 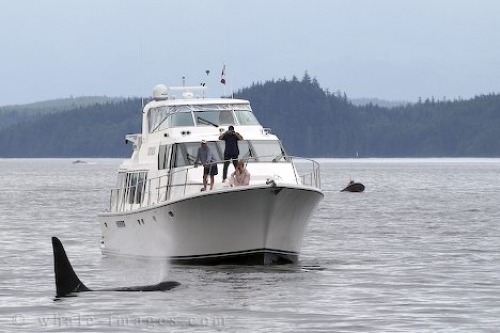 Whale watching and yachting is a popular summer activity off the Northern part of Vancouver Island. Each year in summer a lot of yachts pass through the waters of Johnstone Strait, Blackfish Sound and Queen Charlotte Sound. Some of those yacht owners spend their whole summer in this beautiful part of British Columbia, especially in the Broughton Archipelago Provincial Marine Park. The whole area is famous for the great whale watching, and marine mammals such as Dolphins, Humpback Whales and Killer Whales which are seen almost every day. Picture of a luxurious yacht and a Killer Whale in the Broughton Archipelago Provincial Marine Park off Vancouver Island, BC.